Bottom line up front – pretty nice little tool for moderate use with a few limitations for a good price. Some caveats: I am fairly new to woodworking and don’t have deep experience with a lot of tools. I gave this product 4 stars based on the fact that I think it works well, but I feel like five stars should be reserved for “the best of the best.” (Like grade inflation and such). So, four is a pretty good rating and means I would recommend it to a friend, even a good friend. I also have a Bosch 1617EVSPK which is mounted in my router table. Originally I was going to just use that for everything and just take it out of the table for edge routing, dadoes, etc. That didn’t last long. However, I do have experience with more than one router. I have used the Ridgid for flush trimming, rabbeting, roundover routing, dadoes. It’s gotten a good deal of use in the last three months, so this is not a “hey look how shiny this is out of the box” review. It’s based on use. Price: $99.00 from Home Depot – based on comparisons of ostensibly similar products, I think this is reasonable. - Bit changing is very easy – the whole bottom housing slips right off, then you engage the shaft lock button and only use one wrench to loosen/tighten the collet. - Work light is still going and provides a little bit of extra visibility. - Clear baseplates – one square and one round. It’s good to be able to see through them and changing is again very easy. Also, I use the square base as a sort of “bushing” for my exact width dado jig. Instead of installing a bushing, I just make the guide the width of the baseplate and set the router right in it. Will post that project soon. - Good power – I have not had any problems yet with this router being unable to do its job. Have routed birch, pine and oak. - Carrying case is nice. - Edge guide is easy to use/install. 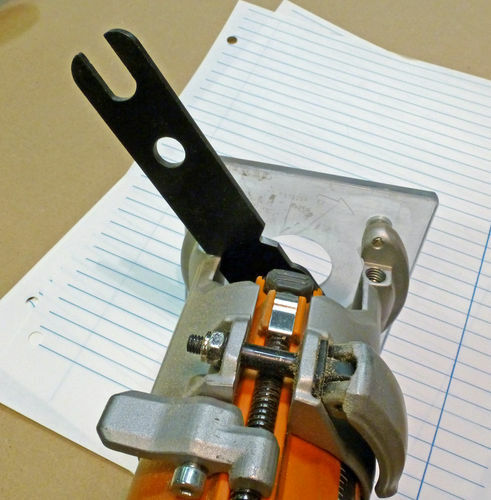 - Depth adjuster feels solid and has good markings on it. When you lock it there is no play up or down, at least not in mine. - Speed control. I like the option. - The overall quality of the unit seems to me quite good – finish, fit, solidity etc. - Power switch location – right on top. The power switch pops up at the top for “on”, which means that unless you are paying attention it is easy to accidentally shut the unit off during use. - Seems to heat up fairly quickly. I have been mostly routing at a very low speeds which I have since learned is not necessary for such small bits. But for really extensive work I don’t know if this would be the best. May not have as much heat problem when I speed it up. Also, it’s been 100 degrees or so here for the last two weeks in my workspace. - I wish the baseplate openings were a little bit bigger. - I don’t like the fact that the edge guide goes down more than 3/4”. Means you can’t use it on a 3/4” piece resting on a workbench. Maybe this is common among edge guides – I still don’t care for it. So, again, I would say that this router sees moderate use in various roles, and fills them quite well for the enthusiastic amateur for a decent price, with limitations that one can certainly live with. I have the R2401 too and love it. I actually have 3 of them and sold my bosch colts. I agree on most points; the led is awesome, the case is nice and compact, two bases is a plus (I use the square ones) etc, however, I disagree about the power switch. I think it’s a great design. It’s very easy to operate and very unlikely you’ll plug it in with the switch on. Another R2401 happy user. I put my review out a while ago and have now used it for quite a while. My impressions have not changed since my review and I still enjoy using it for many things. I am with Nitewalker, and disagree on the power switch. In all my uses, I have never accidentally shut the router off because of the extended switch. In fact, I really like it that it extends above the router body. It makes it REALLY easy to turn off when finished. Just a quick slap on top and the router goes off. I can see this being good if you were needing to turn it off in a emergency. BUT, each user is different and for you Chris, your usage may be different than mine. In all my usage, I have not noticed the heating up of the router. But, I have not left it on for an extended amount of time either and I don’t think I have ever ran it for any length of time at full speed. I normally keep it about the mid-range for everything I have used it for. I have not seen any advantage for anything faster as I have played around with various speeds with different bits and have not seen any change on results. Besides, a more mid-range speed produces less noise too. Happily, so far, it has performed extremely well for everything I have thrown at it. I look forward to many more years of great usage from this. A very thorough review. Thank you. I have 2 small craftsman routers they heat up pretty quickly also…maybe the nature of the beast. I love the small hand held routers, just great for profiling and flush trim bits. I use the hand helds over the large routers 10-1, just easy to set up and go…great tools. I agree completely Bob; that’s why I have 3 of the R2401’s lol! When I grabbed mine they were only $89 and I had a 10% off lowe’s coupon. I see your point about the power switch. It is a good safety feature. I like to hold the router on the side with one hand and on top with the other to steady it, and have shut it off several times by accident. It’s certainly something that I can learn to work around, and it’s definitely not a deal-breaker. I still love the router. All things considered, it’s probably better to have a router turn off accidentally than turn on! Also, I would amend my “negatives” section by saying that all of them are very minor, and none would have prevented me from buying the tool. This is an unusual review here on LJs…..Very informative and you didn’t just open the box , you actually used it ! The motor heating up is caused by slowing down the motor with the onboard speed controller. It will pull more amperage trying to stay at speed, but when you reduce voltage on a universal motor it loses torque, so amps goes up trying to maintain speed, hence more heat. It probably has a warm point at full speed, and you might be adding 15’ to that when going slower, so it feels warmer or slightly hot. Thought about getting one of these, might have to rethink and go get one. looks like a nice unit – good review. as for VS – for the small bits that this is supposed to handle I think keeping it at a constant HIGH speed would be the proper way to use it (smaller bits should run at higher RPM).this might also help relieve some of the heating problems you’ve been noticing. @PurpLev and Paul: I keep the 3 of mine at one notch under full speed and they get warm, but not uncomfortable so. And +1 at higher speeds for the smaller bits these things are designed to spin. I’ve had this unit as well for two years now in daily use at my work. It has replaced my Porter Cable unit that for 25 years I was never really happy with. The power switch is perfect. I slap it against my torso somewhere to turn off, no looking or fiddling. Compact and super comfortable in the hand. Easy to grab low for great stability. My favourite, the centre mounted height adjustment. This is really good. It allows for quick and very fine tuning with little backlash and no vertical misalignment. I’d buy it again for this feature alone. A tip. It’s a bit hard to slide the base off the barrel to change bits and why bother if you modify the supplied wrench slightly. 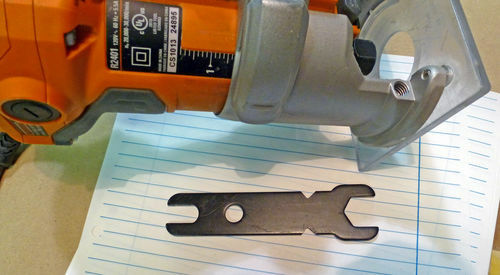 Go to your bench grinder and put two small notches in the side of the wrench like so. Now it will swing far enough to lock or unlock the bit in place. I run it at full speed always as small bits need that high rpm to work properly. The only thing I miss is that it won’t accept standard template guides but I’m modifying one of the bases to do so. I looked at the Bosch Colt and put it aside almost immediately due to the metal base – can’t see a dang thing. Took a look at the current Rigid, it has a round clear base now, not the extended square one shown in vipond33’s photos. I liked it, but not quite as much as the Dewalt, which had all the features and the larger clear base. It was a little more, ($119), and doggone if the Rigid didn’t go on sale for $89 right after I bought! Almost took the Dewalt back. But after it was all said and done, I like the larger base of the Dewalt better, and the clear dust cover on the off/on switch, and the great softstart, (which they all have), is hard to beat. Gene, Thanks for your input also. I am currently considering the purchase of one of these.